Numbers are in. Max effort pull peaked at 588/521. we backed timing out a little bit and settled at 565/505. Very happy with how controlled and stable the car feels, and the power delivery is insane. Camel hump torque....should fly in that little coupe. Good numbers but I'm kind of surprised the torque line isn't more flat than that. I have an almost identical setup in my S10. 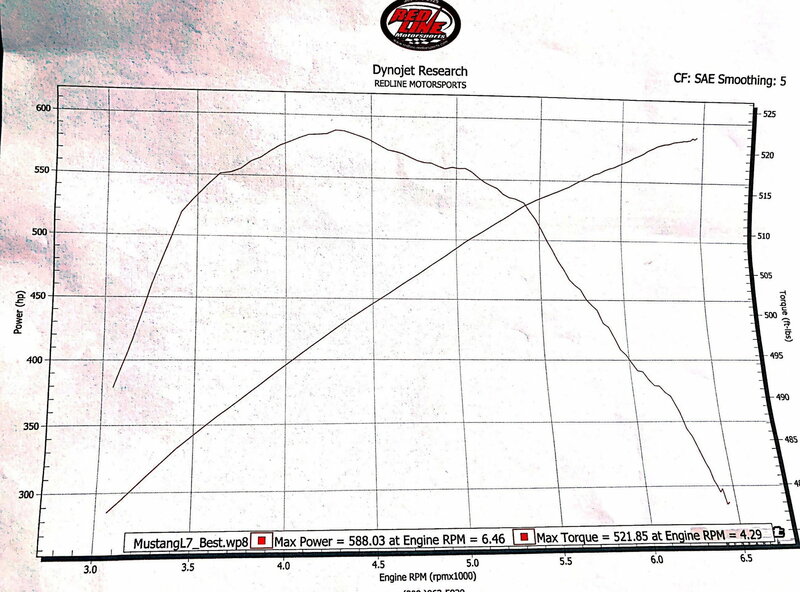 Mine is an LSA supercharged LY6 (6.0 with LS3 Heads) 9.6:1 LS9 Cam and TR6060 close ratio trans 3.42 gear E85 fuel. It looks like it carries pretty good. The problem is the HP and TQ are on different scales. Yeah, that wierd scale for the torque makes it look all kinds of jacked up. Until you realise the entire scale is only 50 ft lbs top to bottom. Wonder why they did that, much more useful if they are on the same scale. Damn why didn't you spin it higher? It was still climbing like a mfer. factory zl1 heat exchanger with a Bosch intercooler pump. Car already feels stupid. I don’t think I need any more power...for now lol. Those are awesome results! If you ever wanted to gain some HP, I'd wonder if there could be some to be had swapping to a 1 7.8th header and 3" exhaust.